The summer of 1940. Nazi Germany had already invaded Poland, Denmark, Norway, Netherlands, Belgium, Luxembourg and France. Now it was the turn of Great Britain to face the German onslaught. Operation Sea Lion, the German code name for the invasion of Britain, was about to begin. Great Britain stood alone. Would it be able to defend itself against attack or would it succumb to Nazi brutality and be invaded? The fate of the British Isles would depend on the bravery and skill of the RAF fighter pilots who would defend it. One of those group of pilots was the Polish 303 Squadron. The contribution of the Polish fighter pilots would prove decisive. In the battle that was about to begin 303 Squadron would shoot down three times the average RAF score with only one third the casualties. In June 1940 France fell to the Germans. Polish airmen in France escaped to Great Britain to continue the fight. On 8 August 1940 Operation Sea Lion began. Masses of German bombers and fighter aircraft attacked Great Britain. On 31 August 1940, at 18.00 hours, 303 Squadron is in the air on a training flight in the London area. A few minutes later they spot the enemy - German bombers returning to France. The Poles immediately attack. Before they reach the bombers three Messerschmitts appear in front of them. In seconds 303 Squadron has shot them all down. On the Poles tail though are three other Messerschmittts but before the Germans can fire on them two Polish fighters covering the rear of the flight open fire. Two of the Messerschmittts are sent crashing to the ground and the third flees for safety. The Polish fighter pilots have entered the Battle of Britain with great success! The next day 303 Squadron is made fully operational. In the third week of the battle the Germans change tactics. They now focus all their efforts on trying to destroy Fighter Command. The German bombers attack RAF airfields and the German fighters try to shoot down their RAF rivals. The British remain resolute and continue to fight. British intelligence is aware that the Germans are gathering barges and building up their military forces. They are preparing to invade Great Britain. The decisive battle for control of the skies over England is about to take place. On 11 September the Germans launch a massive raid. Their target - London. Sixty bombers guarded by ninety German fighters expect to deliver a devastating blow to the British capital. 303 Squadron rises to meet them. They attack the German bombers. The Messerschmitts dive to attack the RAF fighters. The second section of 303 Squadron in turn attacks the Messerschmitts. The German bombers scatter. The RAF fighters then chase and destroy the fleeing Germans. The battle rages over six counties from London to the Channel coast. For 303 Squadron it was a great victory. In less than 15 minutes their 12 fighters had shot down 17 German aircraft. Two of the Polish fighters though lost their lives in the battle. On 15 September the German High Command were determined to secure victory in the Battle of Britain. The Luftwaffe attacked in several waves: the two strongest at noon and three hours later. Hundreds of aircraft were involved. The Luftwaffe however suffered a crushing defeat. They lost 185 aircraft and had more than 200 badly damaged. The decisive blow had been struck. On that 15th of September in 1940 303 Squadron shot down 15 German aircraft and 302 Squadron (Polish) shot down 8. The Poles on that day had shot down one in every seven German aircraft destroyed. For September 1940 the record of 303 Squadron was: 77 German aircraft destroyed, 17 by the Czech Frantisek and 14 by the squadron's three British members (108 in total). Total kills by 303 Squadron for the entire Battle of Britain was 126. Publisher - Republished by Aquila Polonica in 2010. Originally published in 1942. The publishers of 303 Squadron are Aquila Polonica. They are a company specialising in the publication of books, in English, about the Polish experience in World War Two. They have acquired the rights to publish over thirty books. 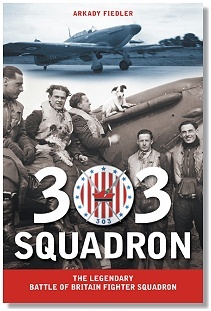 The book 303 Squadron is their third book. Their other published books are The Mermaid and the Messerschmitt by Rulka Langer and The Ice Road by Stefan Weydanfeld. Aquila Polonica was founded by Stefan Mucha and Terry Tegnazian. Arkady Fiedler started writing 303 Squadron during the Battle of Britain. He wrote in Polish and the book was called Dywizjon 303. The first English language edition was published in Britain in 1942. Dywizjon 303 was parachuted into German occupied Poland in 1943 and duplicated copies passed around by the Polish underground. Aquila Polonica have enhanced their 2010 edition of the book with appendices, maps, historical photographs and illustrations. 303 Squadron is a gripping drama with splendid photographs of the men who gave their lives for our freedom. In memory of the pilots of 303 Squadron. 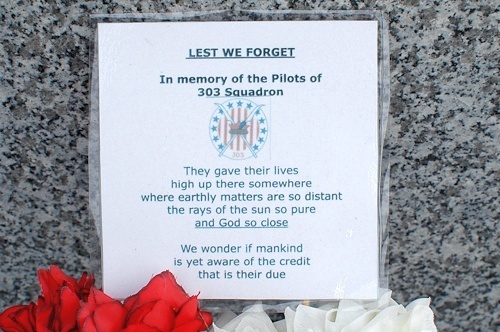 A dedication placed on the Polish Armed Forces Memorial, near Lichfield, England, in memory of the pilots of 303 Squadron. Photo taken on 4 September 2010. The 303 Squadron book contains biographies of some of the squadron pilots. Selected extracts from these biographies are given below. Shot down on 27 September 1940. Buried at Northwood cemetery, Middlesex, England. Posthumously awarded Cross of Valour. Shot down on 15 September 1940 over Thames Estuary. Posthumously awarded Cross of Valour. Shot down on 11 September 1940. Buried at Northwood cemetery, Middlesex, England. Awarded Cross of Valour and two bars. Shot down on 4 April 1942 and lost at sea. Awarded Silver Cross of Virtuti Militari, Cross of Valour and three bars. Killed in an aircraft accident on 14 February 1942. Buried at Northwood cemetery, Middlesex, England. Awarded Silver Cross of Virtuti Militari, Cross of Valour and two bars, and Distinguished Flying Cross. Awarded Silver Cross of Virtuti Militari and the Distinguished Flying Cross and bar. Died in 1981. Killed in a flying accident on 8 October 1940. Buried at Northwood cemetery, Middlesex, England. Awarded Silver Cross of Virtuti Militari, Cross of Valour and two bars, Czech War Cross and Distinguished Flying Medal and bar. Shot down 17 German aircraft and 1 probable during Battle of Britain. On 12 April 1941 during a combat mission to France he was forced to ditch in the English Channel. His body was never found. Awarded Silver Cross of Virtuti Militari, Cross of Valour and bar, Distinguished Flying Cross and French Croix de Guerre. Killed during a training flight on 12 August 1941. Buried at Castletown cemetery, Sunderland, England. Awarded Silver Cross of Virtuti Militari, Cross of Valour and bar, and Distinguished Flying Medal. In July 1940 became British commander of 303 squadron. Awarded the DFC, DSO and Silver Cross of Virtuti Militari. Died in 1998. In July 1940 appointed as British commander of "A" flight in 303 squadron. Awarded DFC and bar, and Silver Cross of Virtuti Militari. Died in 1985. Awarded Silver Cross of Virtuti Militari and Cross of Valour. Died in 1980. Awarded Silver Cross of Virtuti Militari, Cross of Valour and bar, and DFC. Died in 1990. On 27 September 1940 he was shot down and killed over Kent. Buried at Northwood cemetery, Middlesex, England. Awarded Silver Cross of Virtuti Militari. On 29 April 1942 he was shot down and killed over France. Awarded Golden Cross of Virtuti Militari (posthumously), Silver Cross of Virtuti Militari, the Cross of Valour and three bars, and the DFC. Awarded Silver Cross of Virtuti Militari, the Cross of Valour and three bars, and the DFM. Died in 1991. Top scoring Polish pilot in Battle of Britain. Awarded Silver Cross of Virtuti Militari, the Cross of Valour and three bars, and the DFC. Died in 1996. Shot down and killed on 11 September 1940 while engaged in single-handed combat against several German fighters. Buried at Northwood cemetery, Middlesex, England. Awarded Silver Cross of Virtuti Militari, the Cross of Valour and three bars, and the DFM and DFC. Died in 1980. Awarded Silver Cross of Virtuti Militari, the Cross of Valour and three bars, and the DFC. Died in 1986. This page was added on 04 January 2011.